The nearest Neil's father got to buying a narrow boat was in 1972. Neil can remember going up to Market Harborough to look round Springer Engineering. (Springer's were the other narrowboat builder's in Harboro'). Sam Springer himself showed us round, Neil can still remember him saying in his familiar East End drool "We used to manufacture steel tanks, a narrowboat is a bit like that, but it works the other way round!" 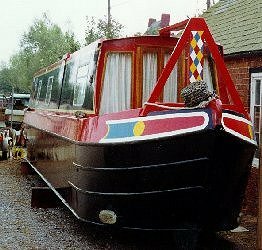 Neil's father was impressed with what you got for your money, £3675 would buy you a four berth 36ft all steel cruiser sterned narrow boat, with 10hp single cylinder Ducatti diesel and a complete inventory. Had Neil's father bought this boat it would now through sentimental reasons, still be our flagship! Neil's dad was a bit put off by the engine and really aspired to a more up market craft with a B.M.C. diesel. 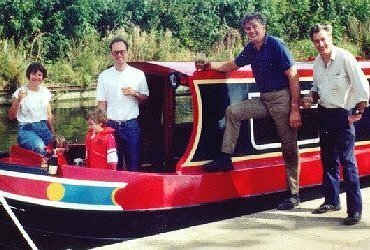 When Neil's dad died in 1989, Neil decided to buy a narrow boat with the proceeds from his estate, but not for a few years until Wendy (who was not yet a year old) and Peter were a bit older. Spring 1990 saw the Arlidge family pining for the canals, Linda bought a Waterways World with the aim of hiring a narrowboat on the Leeds and Liverpool Canal for a one week, one way cruise. Neil was beginning to formulate his plans for a boat, it must be 50ft or under as at this time that was the limiting "Go anywhere" length (Stanground Lock, entrance to the Middle Levels and the Great Ouse system had not yet been lengthened and was 49ft 6ins.) It must have a B.M.C. 1.5 or 1.8 diesel, as we had good experience of these on hire boats. With this engines van background it was familiar to Neil who had been in the motor trade. 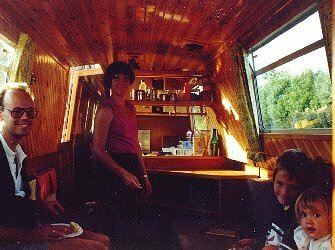 We also wanted a fixed double and another 4 berths (tight in 50ft) and preferably a cruiser stern, which was more sociable and easier for young kids to get off. At the back of the magazine was an advert which caught Linda's eye. 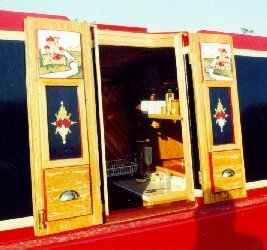 The advert was for a narrowboat for sale at Waterways Services at Nether Heyford near Weedon on the Grand Union Canal. Neil and Linda went up to see the boat the next Saturday, a spur of the moment thing, the next Monday Neil went back up to pay the deposit! The boat was being sold on behalf of someone who had missed and could not afford his last stage payment, because he had been made redundant, for this reason the sale was VAT exempt. The boat had R & D Fabrications 50ft cruiser steelwork, an unpretentious middle of the road builder. They had a long pedigree back to Hancock and Lane and Fernie, who had built some of our favorite hire boats. The engine had not yet been fitted, but a B.M.C. 1.5 rebuild out of a Nuffield tractor was available and agreed upon. This was to have a new Hurth100 gearbox, all new marinising bits around the engine, plus a new alternator, injector pump and new 1.8 type injectors. The electrics were to be fairly simple, 55A alternator feeding one start 90A battery and two 120A house batteries fed by the normal Lucas split charge relay. The fridge was a Batts heat pump type, gas, 12v or 230v and would be gas operated most of the time. The boat was to be loose fitted with a stove (the roof outlet had been fitted, but was subsequently blanked off. ), from the galley half bulk head forward. We agreed to pay Phil Gardner the asking price of £30,000, but with some conditions. 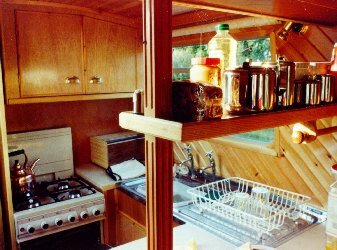 This was as long as he fitted Alde central heating and fitted the front cabin with large triangular shelves where the stove would have been and a walk through double dinette, where the Desmo leg table could drop down to form another double bed. 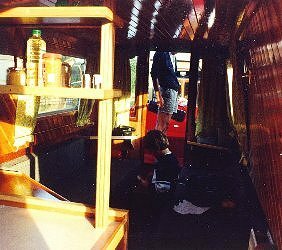 We thus had our 6 berths in the most adaptable way, two extra people could sleep in the gangway on air beds, making a total of 8 berths, this having been done for a few changeover nights in 1997! 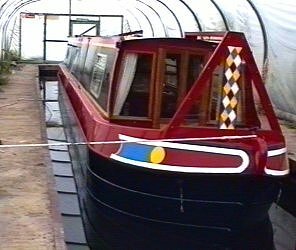 The boat had already been painted in the now familiar colours of Mason's Middle Red base colour, Midnight Blue side panels and Cream lining. This or the reverse red-blue being Phil's "Stock" colours at the time. 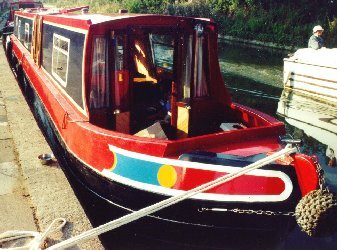 The paintwork was of a very high standard using Mason's commercial vehicle finish, it having been on for a year as the boat was painted before being fitted. The Midnight Blue and Cream have yet to be repainted (1999 = 9years). Part of the deal was that we were to supply the curtains and rails, floor covering and soft furnishing. Linda made the curtains and ordered the rails from Les Draper - Fenda Products, not long after he started expanding his range, they were certainly a lot cheaper by mail order! Neil's crash repair firm of R.D.Akers employed a retired trimmer, Charlie, when needed. When Neil's mum died he gave Charlie her old industrial sewing machine. Charlie made "Beatty's" seat covers on this machine, ensuring another link with the past! Because of children and the dog a tough neutral grey car seat type material was chosen, piped all round and removable by Velcro covered flaps. These have stood the test of time being machined washed every year, drying in the spare bedroom after being refitted to the foam bases. 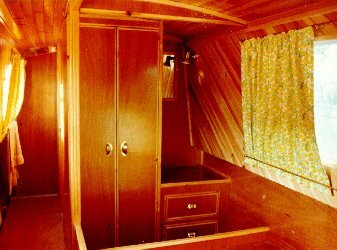 The bright yellow and green curtain material was also used when stiffened to make blinds for the Galley and bathroom. 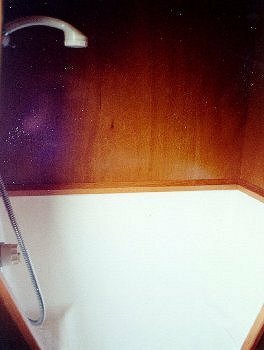 Because of our hire boat and cruise any weather background, carpet seemed inappropriate for our new boat, so plain beige plastic tiles were chosen for all the flooring. These were securely fixed with much Evostick, Neil certainly felt pretty high afterwards! The benefit of this was that carpet tiles could easily be laid at a later time if we so desired. A cheap 4ft mattress was purchased but this never proved compatible with Neil's bad back, so soon after it was stored at home and a pillow less air mattress used, covered with an old duvet to stop the sweatiness. Neil was going to make the cratch when we got back, the cover for this, a rear cover and a "dodger" cover round the stern rails were to be made by a trimmer recommended by Phil Gardner. In the meantime to keep the dog and children in the stern cockpit, a tatty temporary rear dodger was made. While the boat was being finished we had a few weekend trials, these were good in showing up any faults and problems that Phil could sort out when we returned. It is inevitable that there are to be some problems with anything that is built as a one off, narrowboats are not like modern cars and made on a production line. The only mechanical fault was a sticking thermostat, causing the engine to overheat. The fridge was the worst problem, it would tend to overheat, or the burner would go out. This fault was never successfully sorted out by Phil, the over heating being due to these type of fridges requiring to be virtually level all the time, this proved nearly impossible on this boat as the fridge is mounted cross ways. Another major fault was the gas lockers which were each side of the rear doors, extending through the rear deck to water level. Well that was the theory, in fact the two 19KG Calor bottles stood in water with the drain holes under water. There was free space at the top of the lockers, enough for false bottoms to be welded in. This was not noticed until the final hand over day, which was also the day that Ian Burgoyne came over to issue the Boat Safety Certificate. This boat was one of the first to be built with Certificate of Compliance, as they were first called and over the years it has been amusing to see the regulations wax and wane. Most surveyors have been lenient, saying that B.W. should not keep moving the goal posts for a boat that was built initially complying. Never the less Ian Burgoyne said that the gas locker problem should be rectified in the future. 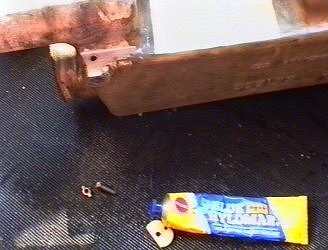 Phil Gardner agreed that the best way out was for me to drop the boat off at the end of next season and it would have to come out of the water to weld up the old gas locker drains, cut new higher ones and weld false floors in the gas lockers. This would also be convenient as by that time I would have made the cratch. Terry Clapham the trimmer recommended by Phil was at the time based on a pair of working boats a couple of bridges up from Waterways Services. He agreed to make and fit the covers and dodger while Phil had the boat out of the water. When were on our way back to Waterways Services the next year John Fleming's mate Al bent the skeg and pushed the rudder up, this was going through Buckby Locks, so Phil had yet more work to do when "Beatty" came out of the water. . The boat had never been named so we decided to christen it "Beatty" in memory of Neil's father as this was one of his Christian names. 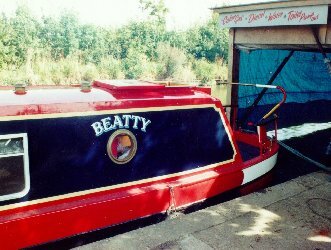 It was only afterwards realised that there had been a famous Admiral called Beatty, and that this was the name of the Admiral Class working narrowboat owned by the campaigning Grundy family. 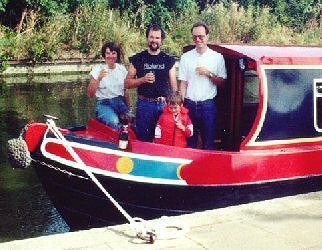 The boat was finished by the October 1991 half - term, when we took it back "home" to Harefield Marina. We took it back the long way via the Grand Union, Oxford and River Thames to Brentford, then back up the Grand Union to Harefield. We decide to leave "Beatty" incognito as we originally intended to only keep it down south for a while. The maiden voyage went without a hitch, we even did the small tidal section of the Thames in the dusk, unaware that we arrived at Brentford when it had officially shut up for the night. The lock keeper was summoned and he turned all the flood lights on and worked us through. He let us stay just above Brentford Locks in the semi tidal bit, telling us to leave our mooring lines slack as the morning tide would cause us to rise a bit as it would go over the weir. He had a moan about Teddington Lock letting us out without phoning him first. We arrived triumphantly at Harefield Marina and were directed to our moorings at the far end, not far of where "Beatty" still rests. The wooden cratch was constructed and painted over the winter out of some left over Wickes hardwood. Laminated glass side windows were purchased locally. A second fitting cage was bought for the old Passat CD radio as well as a Bosch amplified aerial, Pioneer pod speakers and a cheap graphic equalizer. A power amp was "liberated" from a write-off at work. The radio was fitted in the end of the large Saloon shelves and the speakers in the upper front corners on specially made brackets. A cheap Alba 12" colour TV was bought from Argos for £80, at the time they did a dual voltage model (12vDC / 240vAC). Because of past bad experience of people going along with the TV aerial up (with the inevitable bridge disaster - 1979 canal holiday!) the mast just consisted of a piece of 22mm copper pipe with the top end squared off to mount the standard aerial. The aerial lead could be fitted down the tube. The tube mounted through a hole in the front cabin roof overhang being pulled back into two 22mm pipe clips. The waterproof integrity of the upper shower enclosure was suspect, after a shower water was noted on the Masters vanity unit! This was traced to water travelling along the diagonal upper pine plank joints. All these joints were liberally sealed with clear silicone , after 3 extra coats of varnish having being applied. It was decided to leave the spot lamp under the front roof overhang as it was not exposed to the elements, once the cratch cover was fitted it was only necessary to flip this side over to expose the spot lamp when going through a tunnel. Left-over ceramic tiles were fitted around the cooker and the bathroom wash basin. During the first year of ownership a Clarke 2Kw petrol 240v generator was fitted in the engine compartment, obviously this had to come out when the boat was surveyed! Extra double fluorescent lamps were also fitted. Also at this time a cheap Wickes "shed" burglar alarm and an old pair of car air horns were fitted to the right side under the cabin roof overhang. After about 2 years the dangerously slippery red roof was in filled with a large panel of light grey International non slip deck paint. The roof paint was also beginning to craze slightly. The red painted barge pole and boat hook were painted in 1ft red and white bands to form a dual function as manual depth gauges. The gang plank which is only used in dire emergencies, was repainted in it's now familiar red with white diamond pattern. Much experimentation was tried with the fridge, the eventual setup which proved fairly reliable, included a new (smaller) gas jet, and to re-route the flue upwards, through the dividing shelves and out of the mushroom vent! This had the effect of letting the heat pump flue tube draw properly. Excess heat at the top of the fridge (which was good for drying cutlery in the drawer above!) exited through extra vents at the back and a raised section of the work surface. This area proved excellent at keeping breakfast cereal damp free. The other thing you had to keep an eye on was the angle of list, a small chrome spirit level spent much of its life on the top of the fridge. Another gas fitment which caused initial noise problems was the Alde boiler. A spiral band in the flue to draw the burner would give an annoying rattle at certain engine revs (this is heard on many early "Beatty" videos!). This was cured by taking the mushroom vent off and bending this spiral band with a mooring pin. At night there used to be a loud, low "organ pipe" noise from the heat exchanger, this was cured by slightly restricting the air flow at the bottom. At the time "Beatty" was fitted normal flue Alde boilers were allowed, not long after only balanced flue models were allowed, these draw the combustion air down the outside of the flue, I wonder if this would have cured "Beatty's" noisy flue? A self pump out kit was fitted in the engine compartment in spring 1997 along with new iso what ever it is fuel and flexible gas pipes. The diesel lift pump which had always leaked slightly was also replaced. The drive plate between engine and gear box (failed at end of 1997 holiday, replaced with new 2 stage anti chatter R & D type). The rubber "ends" to the manifold cooler (these were replaced many times!). The stern tube, prop, stuffing box and rubber engine mounts. (The prop shaft was always too long and protruded outside the boat too much. The prop was getting a bit worn, so the old one was kept as a spare. 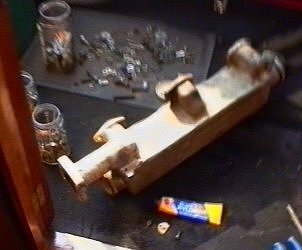 The stuffing box and stern tube had premature wear due to one of the cast engine legs being fractured round the main mounting nut, this was not spotted for a while. The original rubber engine mounts were replaced with stronger more rigid ones as the originals could not take our punishment. The engine leg was strengthened with some sections of angle iron. These were all replaced at the end of the 1995 season. It was at this time that we first made contact with R & D Fabrications, Ray very kindly helped me out with all these bits saving us a lot of money. The oil and filters have always been replaced every spring. 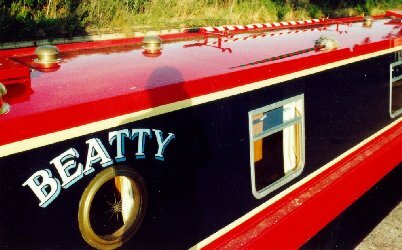 Just before putting "Beatty" up for sale in September 1998, most of the red paint was repainted for the second time by Neil, this time in the wet dock. Also at this time the wooden side hatch was partially re-built as the sides were beginning to rot. The rear rail hardwood cappings were rubbed down and re-varnished. 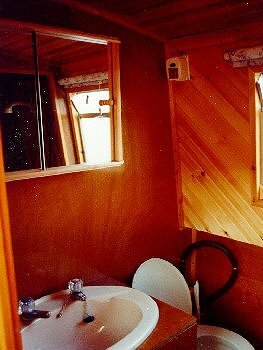 The plywood side and rear doors were also stripped on the outside and repainted as the grain was beginning to lift, the next boat would certainly NOT have any thing wood exposed to the elements! 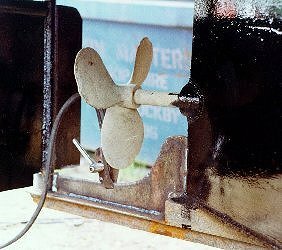 "Beatty" was blacked three times in our ownership and when sold it was no surprise that the purchaser's surveyor said that it needed re blacking and the original anodes replaced. "Beatty" was sold within 4 weeks of being put up for sale, with only one serious enquiry before the actual purchaser bought it. This was just before the Harefield Marina advert came out in the Waterway's press. Following a small bit of bartering and commission to Harefield Marina we got a shade under £25,000. 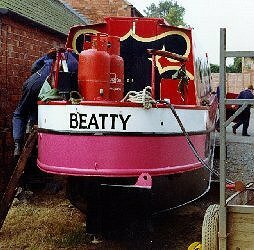 "Beatty" stayed in the boatyard and they re-blacked and fitted new anodes to it. Other work mentioned by the surveyor was also done. The head of the engine was rebuilt with new valves, this cured "Beatty's" now slightly smoky all the time exhaust (most B.M.C. diesels are smoky when cold). I believe that the fuel lines running along the scupper bars were also re-routed as they were too near the exhaust. Items removed from "Beatty" before sale included the air horns, radio cage + amplifier + aerial + graphic (these were replaced with a standard rubber roof aerial and the Blaupunkt stereo out of my old Golf GTi). Other items removed were the gang plank + boat hook + barge pole (the barge pole and gang plank were replaced with ones found on the way back in 1998), the naughty petrol generator and the fairly new plumbed in Lee Sanitation self pump out kit. 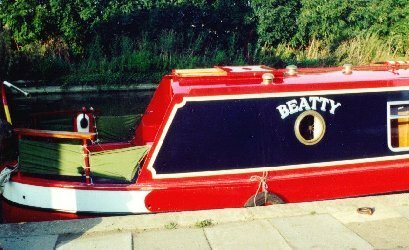 The new owner did not seem to be very keen on "Beatty" and a year later it was sold again by Virginia Currer to another couple who bought "Beatty" back to Harefield Marina. "Beatty" now resides an few hundred feet away from "Earnest". The new owner (Martin Hart - Now a Cutweb Member) seems more enthusiastic, the two original house batteries have been replaced and a 1000W inverter fitted. Autumn 2000 saw Martin finally abandon attempts to get the Batts Fridge to work properly and it was scrapped. An Inlander Electric one has now been installed. Martin also rumoured that the first bloke had also spent money on the gearbox. The matching Galley blind had disappeared and has been replaced with a new plain cream coloured one. It's first main voyage with the latest owner's was up the River Lee in the October 1999 half term. In 2000 they did a "Skirt round the BCN cruise!" "Beatty" just outside wet dock at Waterways Services. Mark 1 dodger round stern. Front cockpit before addition of Arlidge Cratch. Side doors in their original glory. "Beatty" demonstrating original slippery red roof. Galley before addition of mark 4 flue for gas fridge. Wardrobe and vanity unit at end of fixed double. 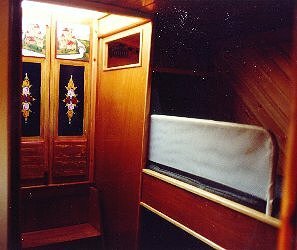 Rear doors, cubby hole and rear bunks. Wash basin and Sealand pump out toilet before Arlidge tiling. Colin, Linda, Peter and Wendy in saloon during September 1991 maiden voyage. 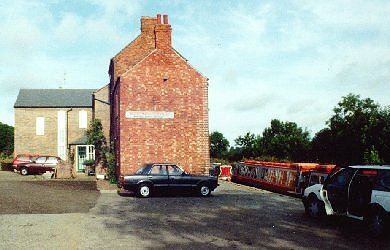 Launch / handover at Waterways Services September 1991. Launch - Linda, Wendy, Peter, Colin, Phil Gardner and main fitter. September 1992 out of the water again at Waterways Services. Putting new false bottoms in gas lockers as others were too low. September 1992 skeg straightened and strengthened. Waterways Services, Phil's house and his trip boat "Saucy Sue". 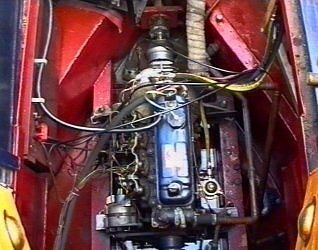 "Beatty's" engine compartment. After overheat on River Nene during the 1998 Tour. The manifold cooler / water top up tank is removed having developed a leak. 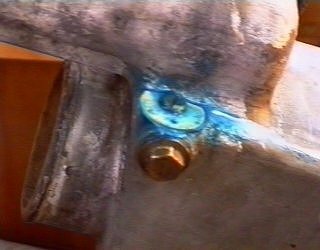 The leak developed from a porous crack in the casting. This has been drilled out and the area filled flat to take nut, bolt and washer to plug it. The completed repair. Atypical "Beatty" running repair. 2½ hours after over heating we were off again. The manifold cooler in front cockpit "workshop". The last picture of "Beatty" in our ownership. August 1998. In Harefield Marina's wet dock after the red and black had been repainted.